The Camberwell Beauty has never been recorded breeding in the UK, but is a vagrant species, with at least a few individuals spotted most years. These occasional visitors have been found all over the UK, especially in East Anglia and the South East. This species was first recorded in the UK in what is now Coldharbour Lane, Camberwell in 1748. Moses Harris, the entomologist who described the discovery, suggested the species should be called the ‘Grand Surprize’ or ‘Camberwell Beauty’, and the latter name stuck. Camberwell Beauties from The Papilios of Great Britain, by William Lewin 1795, Image in public domain. 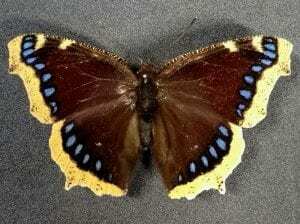 This is a large butterfly with dark purple-brown wings edged in pale yellow with blue spots. It is a widespread woodland species in Europe, Asia and North America and most Camberwell Beauties found in the UK are thought to be accidental immigrants from Scandinavia. Around the world this species has a rather more sombre common name than Harris’ Grand Surprize. 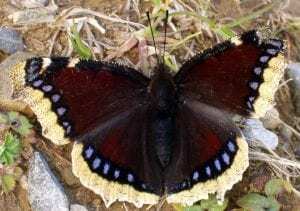 In America it is known as the Mourning Cloak, and its common names in German, Dutch, Swedish, Finnish and Norwegian all have a similar meaning. Although there have been records of this butterfly in London since 1748, I can’t find any records of it returning to Camberwell. Despite not turning up for a couple of hundred years, the Camberwell Beauty has become something of a mascot for the area. 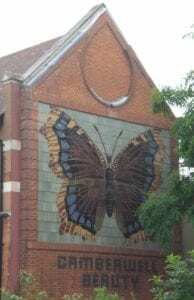 A beautiful tile mural of the butterfly was installed on a local print works in 1909. This mural was saved when the factory was demolished and can now be seen on the old public baths and library building in Camberwell. Butterflies also appear on the gates of Burgess Park, the local shopping centre and even the road signs. We have a few specimens of this species in our collection, most of which are from the D H Walker entomology collection. 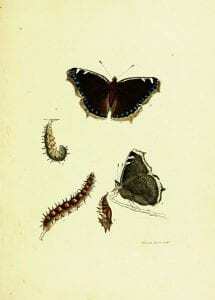 Mr Walker collected butterflies in the middle years of the 20th century, and purchased older specimens of rare or unusual examples. This particular specimen was found by an entomologist called Morrow in Horning, Norfolk in 1872. 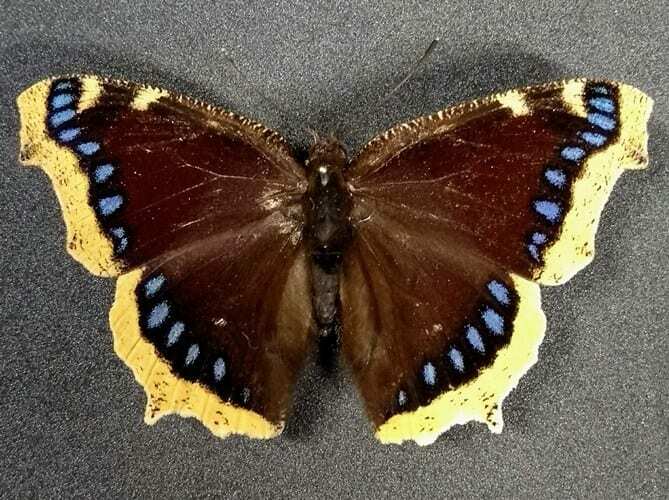 Old insect collections can provide valuable information to scientists, containing evidence of changes in species distribution over time that could be due to climate change or habitat destruction. Mr Walker concentrated particularly on collecting rarities and oddities such as the Camberwell Beauty, and because of this his collection contains examples of species that have since become extinct in the UK. His collection contains British examples of the Large Tortoiseshell, Black Veined White, Large Copper and Mazarine Blue, along with valuable information about when and where they were collected. Collecting butterflies was a very popular past time in the 19th and early 20th centuries, but these days digital photography has significantly reduced the need to collect British butterflies in order to record species distribution.